Russell, an urban conservation program manager with Audubon Pennsylvania, is the founder of Philadelphia’s census. “The reason I started it, in 1987, was to draw attention to the fact that the city of Philadelphia has a thriving population of winter birds,” says Russell, who at the time worked at the Academy of Natural Sciences. Winter bird censuses commonly take place as part of Audubon’s national Christmas Bird Count program. As Russell explains, though, it is impossible to fit a Philadelphia-exclusive count within the Christmas Bird Count rules, which require a 15-mile radius. The city might be 22 miles long, but it is as narrow as 4 miles in some sections. Out in the field, Russell calls out duck species on the water as he sees them: lesser scaup, mallards, buffleheads, ruddy ducks. McGill spots double-crested cormorants flying low over the river. Towey chimes in with a few canvasback ducks she finds. In about five minutes, they have seen all the birds visible from the park, and everyone slips back through the fence and into the car. The trio had started their day shortly after 4 a.m. in Wissahickon Park. “We found six screech owls,” McGill says, locating them by their high-pitched, whiny calls. They planned to keep on birding until around 4 p.m., counting all the birds they saw. Katrina Rakowski, an artist and art teacher who has been birding seriously since 2013, took part this year on a team covering the northwestern edge of Philadelphia. She first participated in 2014 as a novice birder, covering Temple University’s campus. 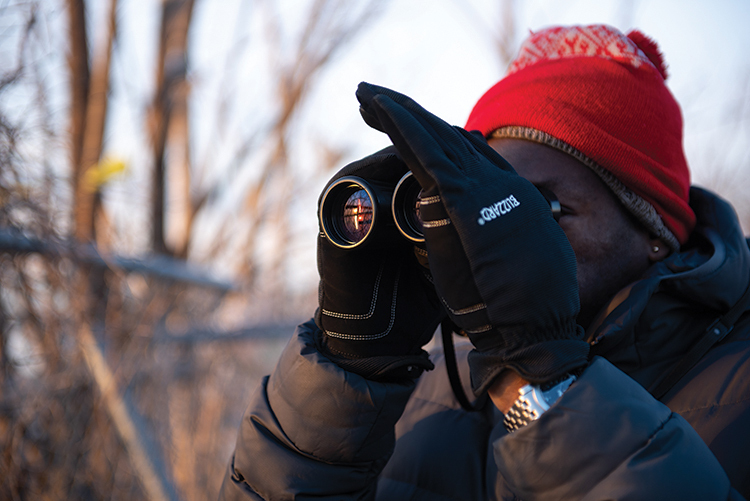 “We would not have gone out birding for pleasure ... but it got us out, so to speak, moving around and getting more acquainted with what’s outside when the weather is not as nice, and the birds are still out there,” Rakowski says, noting the extremely cold weather during the 2018 census. “It’s so nice to have some sun,” Russell says gratefully as they again hop out of the car at a city recycling yard upriver. They spot a coot among the ducks and geese just waking up on the water. A fish crow gives a nasal “caw” as it flies overhead, and McGill stops everyone to pinpoint a raven’s hoarse call in the distance. Soon he spots it on the roof of a decrepit factory. A kestrel, a small and colorful falcon, flies overhead and lands on a giant smokestack closer to the car. Towey, McGill and Russell down a quick snack in the car before heading over to the nearby Northeast Water Pollution Control Plant, home to a flock of famous (among birders, that is) rough-winged swallows. Ordinarily swallows fly south to Latin America for the winter, since their insect prey is not available in the cold. However, a flock of intrepid swallows chooses to skip the migration and stay all winter, eating midges that breed at the plant. Other normally migratory songbirds join them, and this year several teams of census participants converged on the plant to see what novelties might turn up. They were rewarded by three species never before documented in the winter in Philadelphia: Nashville warbler, Cape May warbler and a blue-gray gnatcatcher. Philadelphia’s census is co-sponsored by the Delaware Valley Ornithological Club and Audubon Pennsylvania.